This horn kit will give you Hours of Entertainment! Sound Like Dukes of Hazard Hollywood Horn-Plays 11 notes of Dixieland!! Perfect for Car, Trucks, RVs, anything with 12vDC power. 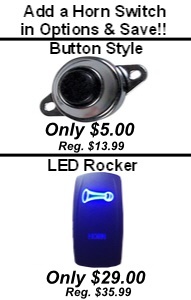 Also great item on your Golfcart or OHV. This Assured Performance 11 note 5 Trumpet Dixieland Musical Air Horn Kit is the most popular musical horn we sell. Made popular by the "Dukes of Hazard: TV series. You can now install the famous tune that the General Lee made popular in your ride. The kit includes basically everything you except wire and inline fuse. Treat yourself or give as a gift to another fan of the Dukes. Install time is normally less than 2 hours.